Gareth Evans’ “Apostle,” premiering today on Netflix, is an unsettling journey into a very dark corner of the world that may first seem like a radical departure for the man who made the stunt-heavy “The Raid” and its even-crazier sequel. The first hour or so of this ambitious piece of work is designed to slowly bring viewers into a mystery and raise questions about the exact dynamic at play. And then “Apostle” answers those questions with viscera, plasma, brain matter, and other bodily fluids. What starts as a psychological riff on “The Wicker Man” becomes a gore-filled riff on, well, “The Wicker Man,” with all the flair and elan you’d expect from the man who designed the stunt sequences in the “Raid” films. 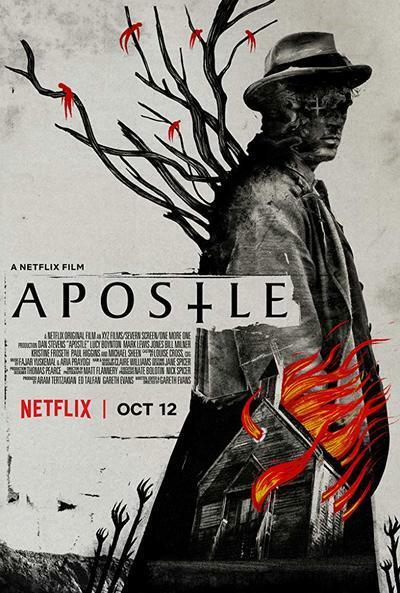 Not unlike “Mandy,” some of both halves feel self-indulgent, and I’m not sure “Apostle” quite justifies its 130-minute running time, but you have to say this about it: It’s like nothing else you could include in your annual Halloween horror marathon this year. It is 1905 and Thomas Richardson (Dan Stevens, in full, wide-eyed “Legion” mode) has just learned that his sister Jennifer (Elen Rhys) has been kidnapped. She is a prisoner on a remote island that is running out of resources to fund its increasingly desperate religious cult. The followers of Prophet Malcolm (Michael Sheen) are starting to lose faith as their crops have dried up and conditions are worsening on their small patch of land. Malcolm preaches patience and he sees an opportunity in this girl, who the cult can hold for ransom. Thomas travels to the island undercover, sneaking into the society, and learning that this religious group is not as harmless or even earthly as he might have first believed. There are so many horror films every year that do the things that simply never cross Evans’ mind. He’s not here to hold your hand. He’s not here to present a straightforward narrative. He's not here to make you happy. Some people will consider “Apostle” incoherent, but it’s the eagerness to deliver an exact vision that I admired about this strange, frightening work. In an era when more and more films feel focus-grouped to death or designed to sell toys, it can still be refreshing to see one that it is so completely the crazy brainchild of its creator. Well, as refreshing as a movie with this much bloodshed can be.